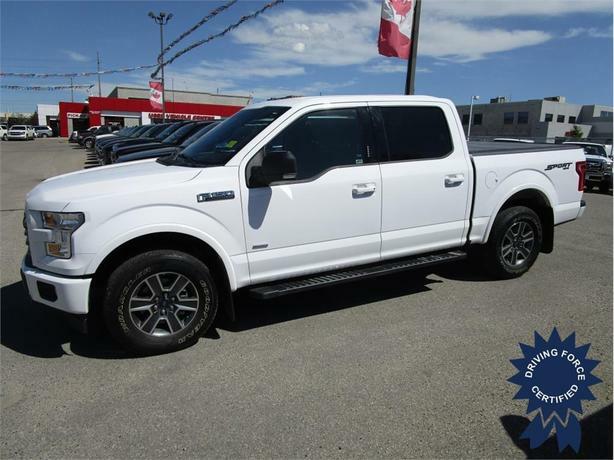 This well optioned 2017 Ford F-150 XLT Sport Crew 4WD Short Box will not last long. Equipped with cloth bucket seats, tonneau cover, side entry steps, 5.5-foot short box w/spray-in bed liner, large touchscreen, backup camera w/zoom, tailgate step, power driver's seat, fog lights, power adjustable pedals, 400W integrated power inverter, steering wheel audio controls, 3.55 axle ratio, 2.7L EcoBoost V6 twin-turbo, sport appearance package, passkey door entry system, balance of factory Ford warranty, clean CarProof verified history report, two sets of keys, and our 120 point certification. Call or email one of our knowledgeable fleet sales consultants in Calgary today and experience the DRIVING FORCE difference today.